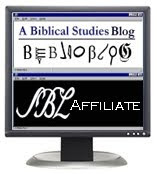 Bibliobloggers as a group have become affiliated with the Society of Biblical Literature. We look forward to partnering at our North American and international meetings every year. This partnership will make possible the fostering of biblical scholarship and communication among members of both groups. The affiliation will enable Bibliobloggers to meet and hold sessions in conjunction with SBL meetings. Individual bibliobloggers who are members of the Society of Biblical Literature and who wish to identify themselves as affiliates of the Society may post this ‘badge’ on their blog. I want to thank Jim and his colleagues for their efforts. This is a partnership long overdue, and it’s great to see it come to fruition. This is especially exciting news. For one thing it raises the academic respectability of biblioblogging. Since Brant, John and myself are all three members of the Society of Biblical Literature, we are pleased to announce that this blog will henceforth be an SBL Affiliate Biblioblog. Thanks in particular to Jim West for leading the charge of bibliobloggers everywhere!